Online metadata viewers. If you need one, we have a list….. There are online metadata viewers you can use to view metadata on photos. While I doubt that’s earth-shattering news to any of you, a quick Google search on the subject returns breathless posts. “OMG! There’s metadata! Look! See!.” Granted, we have a lot of educating to do if we are to improve the environment in which photos must live online, but it’s a bit over the top. Let’s exhale and see what, if any useful resources we can find here. First, there’s the question of why and when we might need an online metadata viewer. And the answer, it seems to me, is corner cases. If you’re a photographer, you may want to label a photo while working on, say, a friend’s tablet. Just this once. Or maybe you need to check GPS information on a picture and, for some reason, you can’t just look at it on your phone or computer. Maybe the picture is online and you’re not comfortable with downloading it. My point is: 99.9% of the time you have no use for an online tool for viewing metadata. For that one-in-a-hundred corner case, we have some options for you. Online metadata viewers allow you to access one or more of - Exif, IPTC, and XMP metadata blocks in image files or from images published online. Jeffrey Friedl’s Image Metadata Viewer returns a complete ExifTool output, nicely formatted. This site provides you with a comprehensive view of your metadata, from either files on your hard drive or the URL of an image on the web. Friedl is well known as the developer of several useful Lightroom plugins. That suggests that you’re uploading your file to a likely trustworthy site, run by a reputable person. This is the best of the online viewers per se, and the only one I can really recommend. There are no ads on this site. Friedl pays the expenses himself, so don’t abuse his generosity. Save the URL for that rainy day when you actually need a service like this. This excellent viewer was developed by IPTC Managing Director Michael Steidl. It’s available for free on his test site. This viewer has especially nice presentation features. You can run it on your own server, too, if you want. See a detailed post on this viewer here. Flickr, love it or hate it, is a huge player in online photo management. If I haven’t mentioned it before, the service (mostly) honors embedded metadata. The IPTC/IIM Caption and Headline fields are mapped to corresponding fields in Flickr’s various views of your photo. All of your original metadata is preserved when you download a photo – as long as you download the “Original” version of the photo, that is. Grammarians could rightfully object to “Show EXIF”, which isn’t descriptive of what the link does. On top of that, it’s “Exif”, not “EXIF”. But what do you expect from people who can’t spell anything that ends in “er”? Update: Reader José Oliver-Didier Added in the comments that “In Flickr you can add “/meta” (without the quotes) to the URL of a Flickr photo page and get a nice table with the file metadata.” Indeed, you can. What’s more, if you call up metadata this way you inexplicably get better formatting. It’s a fair bit easier to read than the results of the “Show EXIF” link. The editor in Google photos will display the caption of your photo. (the XMP-based copy) That’s it. Just the caption. The grid view in Google photos shows a snippet of the caption, too. If you use Google services, it could be handy. I’ve put this service on the list, and near the top, for the same reason as the DickPicLocator: It doesn’t do much, but it comes from a reputable provider. Exif Meta Viewer for Drive returns metadata sorted by data block. This viewer is actually promoted as a Chrome app. Don’t go there. The app just opens the webpage. But when used just as a webpage, Exif Meta Viewer for Drive is a very functional online viewer. It has the ability to view files stored in Google Drive, if you care to authorize that. All Per Axbom’s site does is read GPS information. You may upload pictures that don’t depict penises, so that’s not a limitation. I’m including it in the list because Axbom is an ethical guy. I wouldn’t have any qualms about uploading a picture to his site. If you just need a quick look at GPS coordinates, and privacy is a (moderate) concern, this could be the solution. Besides, it’s kind of fun. See my post on this quirky site here. https://editor.urbanbird.io seemed to me as though it might have been intended for actual birders. (Although the site’s homepage touts a more general travel-oriented product.) It allows you to see and edit Exif data and geotag images. It outputs a map with your tags. This apparently Ukrainian online viewer returns Exif, IIM, and XMP data. It allows editing of metadata. Yeah. Ukrainian. That, and the creepy “….com.ua” business gives me pause. https://www.imgonline.com.ua/eng/exif-editor.php is the only one that lets you edit metadata, so it gets a spot near the top of the list. http://imgops.com/ has many image-related tools that can be selected once you have given it the URL of a photo. (It doesn’t work with uploaded files.) The metadata link took us to output from Jeffrey Friedl’s viewer. Friedl pays for the bandwidth for his tool out-of-pocket, so that doesn’t seem like good cricket to me. Use Friedl’s site. 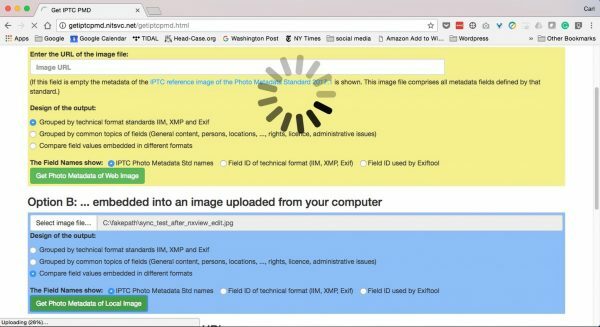 http://metapicz.com/ returns Exif and XMP data, but not IPTC/IIM! Where’s the fun in that? http://onlineexifviewer.com reads only Exif data. It was not able to read the GPS information in my test image. http://www.verexif.com/ allows you to view and remove Exif data. It successfully read the GPS data from our test file. Now, if you have enough of a privacy concern to be seeking a way to zap your Exif data, do you want to upload your file to arbitrary site with funky-looking advertising on it? …. Me neither. http://findexif.com works only with URLs for online images. It returns only Exif data. http://www.extractmetadata.com/ returns Exif data, including GPS. http://camerasummary.com shows only Exif data. It inexplicably failed to expose GPS coordinates in our test file. http://www.fileformat.info/convert/image/metadata.htm supposedly outputs metadata as a text and an XMP file. On two test files, it failed to return any data. The sites in our survey ranged from fine to downright funky. Some of them are clearly the product of developers who know just enough about metadata to be dangerous. If you squint your eyes a little when you look at them, there’s some insight into the how the public perceives metadata in general. Which should come as no surprise to anybody reading this blog. Why, oh why, does the notion that authors might include a copyright notice or caption with their photos not seem important, or even dawn on most of these people? Oh well. But if the need for an online metadata viewer ever arises, now you know where to find one. Do you know of any online metadata services that I missed? Do you have an endorsement or a horror story? Jump into the comments and let us know. Cool. Thanks, José! I’ll add this to the body of the post.